The most prominent of Gurdjieff’s worlds of words are the languages in which he taught—Russian, German, French and English—but it was particularly in English that he gave free range to the life of words and applied his imagination to probe their deep meanings. 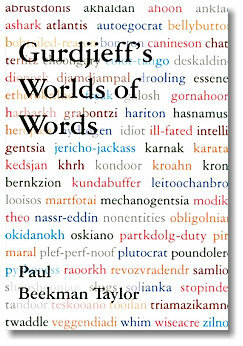 A trace of the worlds of words in all his works in English, including The Herald of Coming Good and the unpublished Struggle of the Magicians, reveals c.
In particular, Gurdjieff’s command of English is paramount to his perspective on human life and its possibilities of development. Though some readers have thought that Gurdjieff relied completely on his co-editor, A. R. Orage, for his explorations into the English language, this study shows that Gurdjieff exposed his personal idiom in his writing. His puns, recondite etymological forays and historical-linguistic allusions challenged his readers and listeners to question their understanding of his discourses. Comparison of French, German and Russian texts of Beelzebub’s Tales with his English, along with records of his use of all these languages confirm an extraordinary command of the English language that served him better than any other for the gist of his writings. Furthermore, Anthony Blake, philosopher of thought, founder of DuVersity, author of several books including The Intelligent Enneagram, student of the physics of hidden order, writer of the introduction to this book, adds an excursus to “Struggle of the Magicians” on the semiotic gist of Gurdjieff’s dances and music that make story.